I made it, I made it! 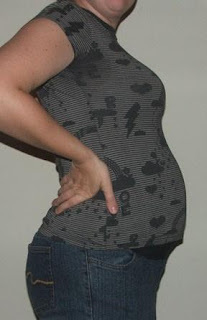 Here I am officially in the 2nd trimester! And yes, my energy is back, I'm peeing less, no sickness, and I can eat pretty much whatever I want/feel like. However, with the energy being back I tend to do more, which makes me pretty tired when I'm done. And I eat what I want or what the baby "tells me to", so sometimes that means eating a dill pickle, followed by an orange, followed by a Devil Dog with a glass of milk... not really sure why I didn't throw up after eating all that last night around 9 pm! Just reading it kinda makes me go "ewww"! And honestly the only downfall so far to hitting 14 weeks is that my uterus is growing like crazy, causing INTENSE and constant round ligament pain (RLP). I thought I knew what RLP was, you know, when you roll over in bed and have that sudden sharp pull in the groin area... well what I didn't know was that it could be constant and last for days even weeks. I got 1 piece of advice that I really didn't care to hear, "it will definitely be over after you deliver"... gee thanks! After about 24 hours I got some relief with 2 tylenol, a heating pad for 15 minutes and a bath... oh the bath! I think my insides started floating and it felt so much better! I started this morning off with 2 tylenol and some heat so I'm pretty much pain free this morning.... well after the Charlie Horse went away in my right calf! I told my doctor that I know the baby is doing great but I feel like I'm falling apart around it... but he said all is normal. It just goes to proove that all pregnancies are different, and some aren't easy! But, in honor of hitting the 2nd trimester, I had Chris take my belly shot. I honestly didn't think there would be that much difference from 12 weeks to 14... I mean, yah we did go shopping Sunday for maternity clothes and I'm pretty much only wearing maternity now, but really, that's for comfort right?! 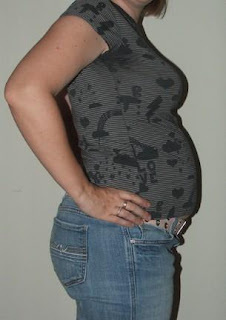 Well, for reference I've added my 12 week photo along with yesterday's 14 week photo...HOLY MACKEREL! That's all I have to say, go see for yourself! too cute! yey for the second trimester! yay 2nd trimester!!!! and so cute belly shot!